The history buff and lead developer, Robert Smith, joined us for an interview to talk about his career path and his experience after working for the Total War franchise, going on to founding his studio, and making his own game. I was also able to talk about the studio’s endeavor to make a grand strategy title and how Oriental Empires is able to distinguish itself from titles that have millions of dollars sunk into them. ...Has the work gotten easier, or harder, or were there new challenges? Well, it’s different. I mean, in a lot of ways, it was going back to my roots. Back in the 80s, I made independent games.[...] It’s going back to that. So you had a period where you started out small, then you worked for big companies, and now you decided to go back to that because you enjoyed that more? It’s different. In a lot of ways, it’s harder. You know — you’re the guy taking all the risks with everything, and so it’s always in your head. But then you get to do what you want to do. Ultimately the success or failure, it’s in your hands. As a man who moved around the world to develop video games, you moved from Britain to America. Would you say it was a plus to have that international experience? Was anything hard about working in that way, working for companies that were in other countries? Right, well it’s a great way to see the world. I started off in Britain; I worked to America for a bit, then I worked in Australia, now I live in Thailand. And I worked in Switzerland for a while. What game were you working on there? Nothing you would have heard of. We worked for a little Swiss company [...] doing games for the German market. You released Oriental Empires on September 14th. 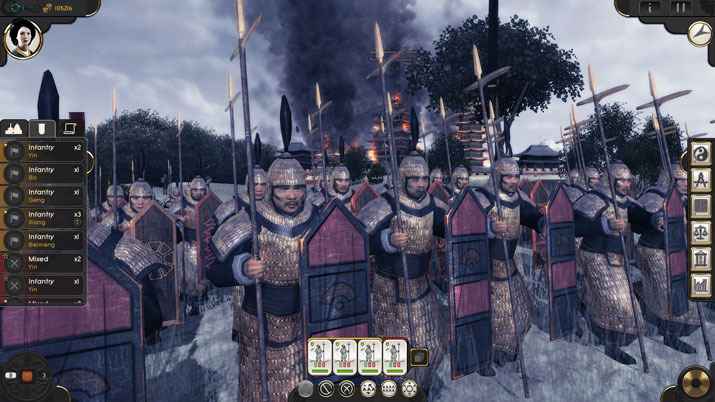 If someone knows Total War and like me is a big fan of the Total War franchise, can they know what to expect from Oriental Empires? How is it unique? Well, I like to think it’s unique. It’s more of a Civilization-type game than Total War. The inspiration was to make something a bit like Civilization with more interesting combat. So, if you primarily like Total War for the battles, you may be a bit disappointed with Oriental Empires . On the other hand, if you like the campaign side of Total War, I think you’ll love it. In Oriental Empires, we have these mass battles, you can watch them going on with a sort of visceral action, but you don’t actually control them real-time. There are a few advantages to that. It doesn’t break up the flow of the game taking you away from the game and plonking you into the battle. You’re not going to have to make a decision whether you’re going to spend ten minutes fighting a boring battle or take your chances with the auto-resolve. I always found it a little disappointing when playing TW that you were torn out from what you were doing and then for half-an-hour you had to fight that battle which sometimes turned out to be tedious. That’s an approach I very much appreciate about Oriental Empires. In some sense, that was a problem that we solved better in the first two Total War games. Because they were area-based, if a force was disadvantaged, you could just have it retreat. Have you already gauged the feedback by the player community for Oriental Empires ? There are a lot of people who love it, (and) quite a few people who don’t. You know, people like the [...] mechanics, having the battles directly on the map, the simultaneous movement, the setting, the look of the thing. Other people are disappointed that it’s not Total War — that they don’t get to control the battles. It’s a big game made by a small team. There are some rough edges. We continue to work on the things people complain about the most. The AI is always a big problem in intricate strategy games. How were you able to create an AI that challenges a single player? I got quite a bit of experience creating AI down the years. It’s pretty much proven formula. It’s very heavily based on what I did in Armada 2526. You kind of know what works and what the structures are to set up. Small studios usually don’t come up with grand strategy titles. I imagine that to be the case because of all the work that goes into that. Would you say small or young studios can undertake grand strategy titles or do you need a lot of experience and a lot of staff to make a good one? There are actually quite a few, 4X games, particularly space games, being produced by small teams. It’s definitely something that can be done. It’s a lot of work. You have to define your scope. For instance, the original reason for limiting to China, to zoom in on a particular culture, was to limit the scope of the game and the assets that have to be created. That’s one of those choices that appears to be a limitation, but as you start getting into it, the history of China, you realize that being able to zoom in a bit is actually something of a gift, an opportunity. Yes, I am. Until I began to work on Oriental Empires, it was classical and Hellenistic Greece. Our reviewer said that he would love a project like Oriental Empires about the Phoenicians or the Etruscans. Are you planning on a sequel or new titles? It’s a little bit early for that. We were asked about expanding the game to Korea and Japan. Initially, we’d like to expand and include some of the surrounding areas. I could see the game itself be moved to a completely different locale. That is is quite a long way in the future. I think I’m also looking forward to see what modders do with it. The game is made with the Unity engine with quite a lot of customization. There is an upside and downside to it. It’s kinda hard to support modding. We will have to do work to support that, and we’re going to roll that out in a few months. That’s something we’re very keen to do, but we haven’t done, yet. If you couldn’t play Oriental Empires, what strategy games would you play? I’m a bit behind the times, really. I’m quite keen to look up the new Total War: Warhammer. That seems like a step in quality there. The other genre I like is racing games. 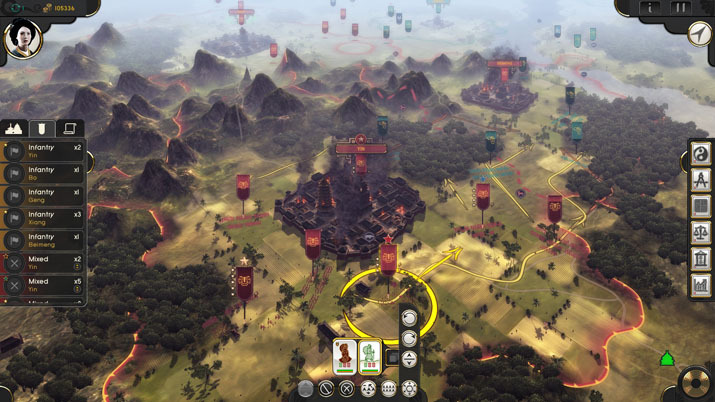 Oriental Empires is an empire building game, a civilization building game set in ancient China — (there’s) some 4X style gameplay mixed with some realistic history, where you raise Chinese civilization over about 3000 years. Thank you so much for the interview, Bob.